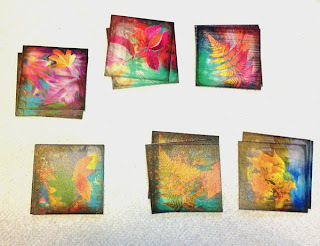 Printing images on water soluble paper to embed into your melt and pour glycerin soaps is a wonderful way to create something unique and even personal. You can use words, phrases, digital artwork or anything that you can put into digital format to be printed. 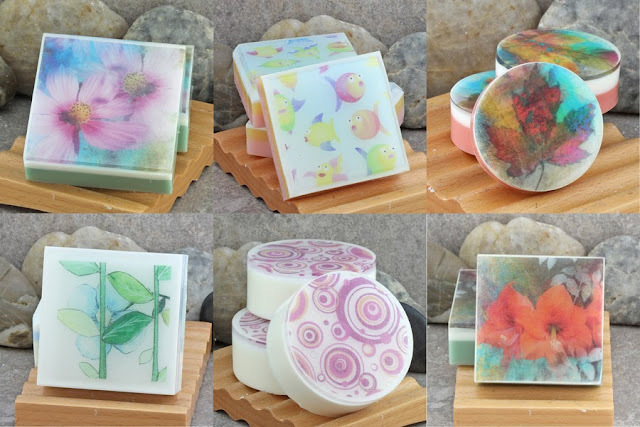 These soaps are wonderful as home decor to compliment a variety of themes from children's bathrooms, guest bathrooms or even as shower favors. They also make unique, one of a kind gifts. There is very little information around about how to use this water soluble paper and none of the techniques I uncovered worked well for me. Therefore, after lots of experimentation, I have come up with a technique that works for me. What you will need to create these types of soaps. I use only SFIC soap bases and therefore, this tutorial is based on those soap bases. I do not know how other soap bases perform and at what pouring temperatures. 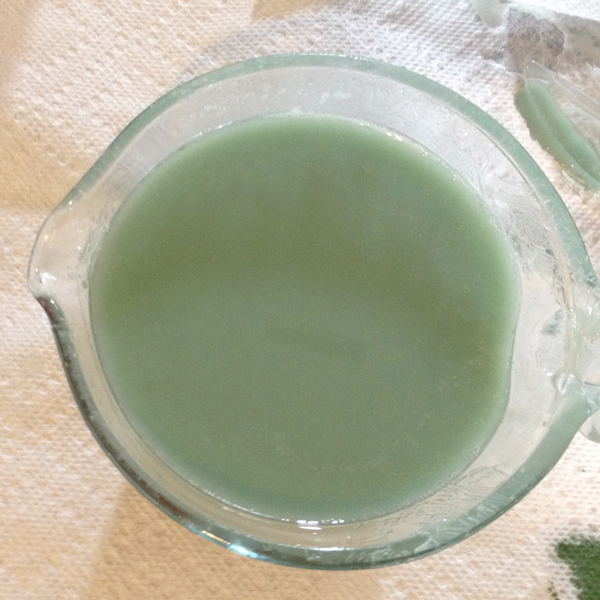 I use liquid non-bleeding colorants from Bramble Berry to color the colored layers. 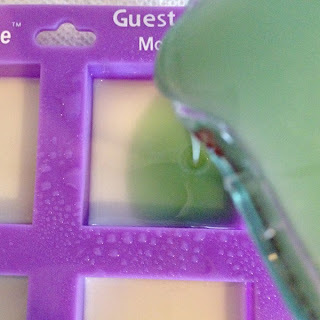 I like to use the guest size silicone molds from Wholesale Supplies Plus as they are sturdy yet flexible and the soap is very easy to remove from them. 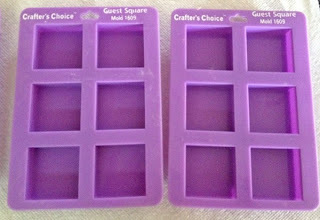 For this tutorial, I am going to make square guest size soaps. The individual cavities for this mold are about 2" x 2" on each side (not diagonal). Measure the interior dimensions. 1. Choose your artwork, size it accordingly and print it on the water soluble paper. You can print individual images or an entire sheet of art and cut accordingly. I use a color laserjet printer (HP model CP2025) on a finishing setting that gives me nice vibrant images. I allow the printed paper to sit or cure for at least a day or so to make sure that the ink (or toner in the case of laser printers) is completely dry. If the ink is not completely dry, it can bleed into your soap. 2. Cut the printed artwork to fit the size of the mold or a portion of that. I want my artwork to fill the entire top layer of the soap and cut it just a hair smaller than the interior dimensions of the molds. For the square molds, I use a straight paper cutter as I want these to be perfect squares. I therefore size each image to be slightly larger than 2" x 2" so when I cut them, there are no white edges - all image. 3. Melt several ounces of the clear melt and pour soap. 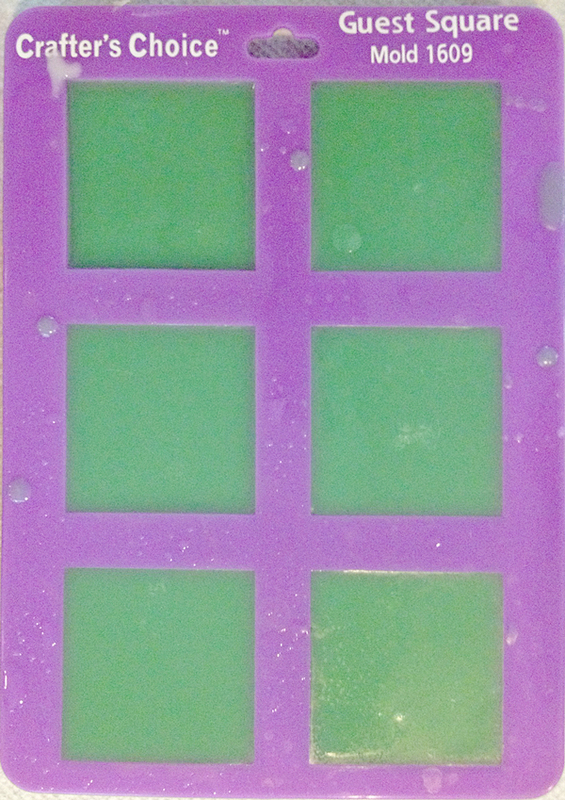 The SFIC clear soap has a yellow cast to it so I use the bluing technique to get the soap as clear as possible. 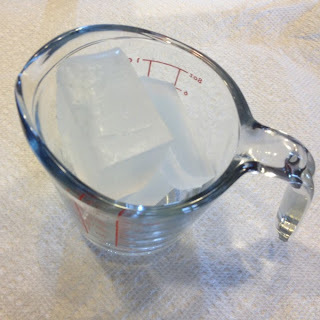 Once the clear has melted add the liquid blue in very tiny amounts until you achieve the clarity that works for you. Do not add fragrance to the clear soap. 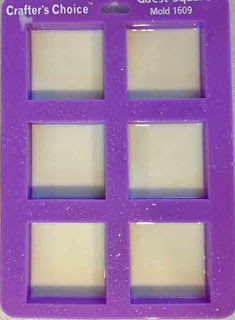 Many fragrances will cloud or discolor the clear soap. 4. Pour a very small amount of the clear soap into the bottom of the mold and spritz with the rubbing alcohol. 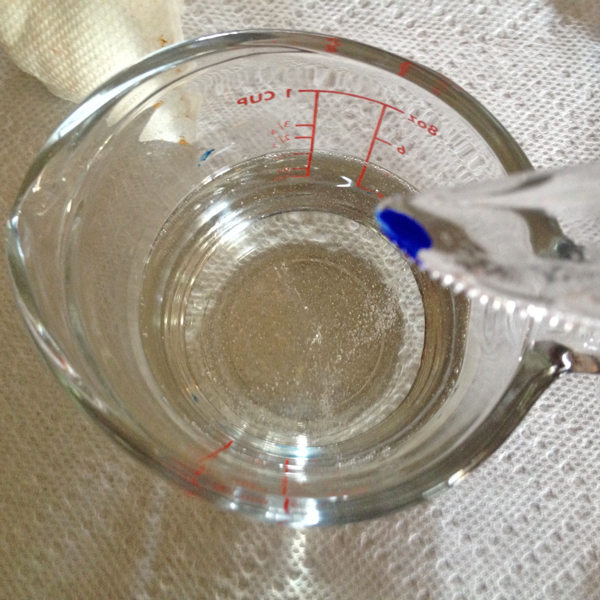 You do not want to overfill with clear - just a very thin layer about 1/8". 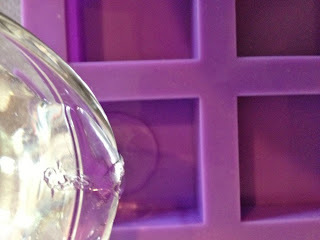 Note: spritzing with the rubbing alcohol helps the melted soap to spread and fill the bottom of the cavity into the corners. I like to pour the first layer when the soap is 150 - 160 degrees. 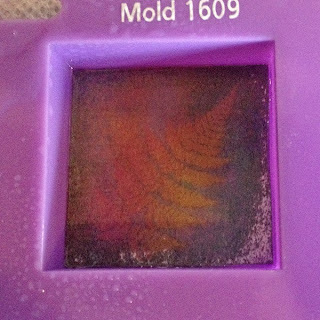 You need it fluid enough to easily spread across the bottom of the mold and not start setting up as it hits the cooler temperature mold. 5. Immediately take one of your art elements and place upside down on top of the just poured clear base. You want it to immerse slightly into the clear base so that the paper looks wet. Spritz again with alcohol one or two times. 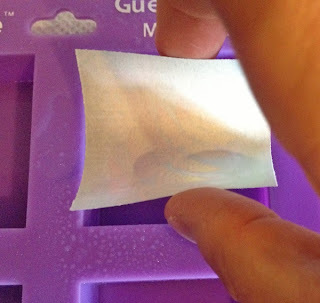 I find that by placing your water soluble paper into the soap while it is still fluid, you reduce the chance for air bubbles that may form between the clear layer and the paper. 6. Let this layer set up. Because it is such a thin layer, it will not take much time at all for it to set back up and harden. 7. Melt some of the white soap. This can be any of the white formulations (cocoa butter, shea butter, goat's milk). For these I am using the SFIC Goat's Milk Base. 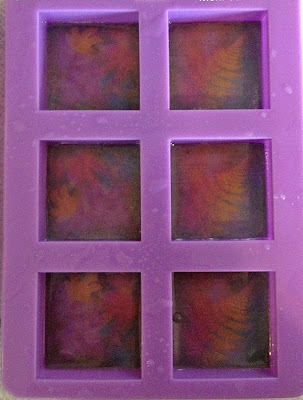 From this point on, you will layer your soap like you would normally layer any other style of melt and pour layered soap. You want to use a white colored soap as the next layer to make your image really pop. If you color this layer, that color will show through the paper. It may look like white paper, but it is more translucent than it appears. 8. 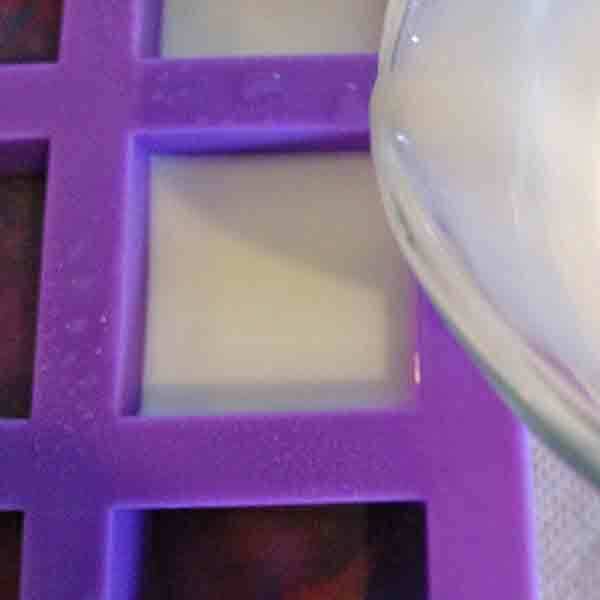 Add your fragrance or essential oil to the melted white soap. For these soaps, I am using Juniper Breeze Cybilla Fragrance Oil from Bramble Berry. 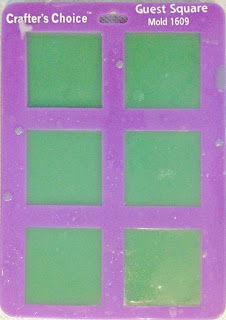 It is a lovely green scent that I think will coordinate nicely with the botanical artwork I am using for these soaps. 9. The white fragranced layer is poured when it cools to between 125 - 130 degrees F. Spritz the bottom layer a few times with the alcohol prior to and after pouring this white layer. If you want just the white layer, you can fill the entire cavity with the white. If you are going to layer with another color or two, add as thick a layer as white as you choose. 10. Take more of the white base or a combination of clear and white to create your next colored layer. The more clear in this mix, the deeper shades of color you can achieve. The more white, the more pastel your shades will be. Fragrance this melted base too according to the suppliers recommendations. 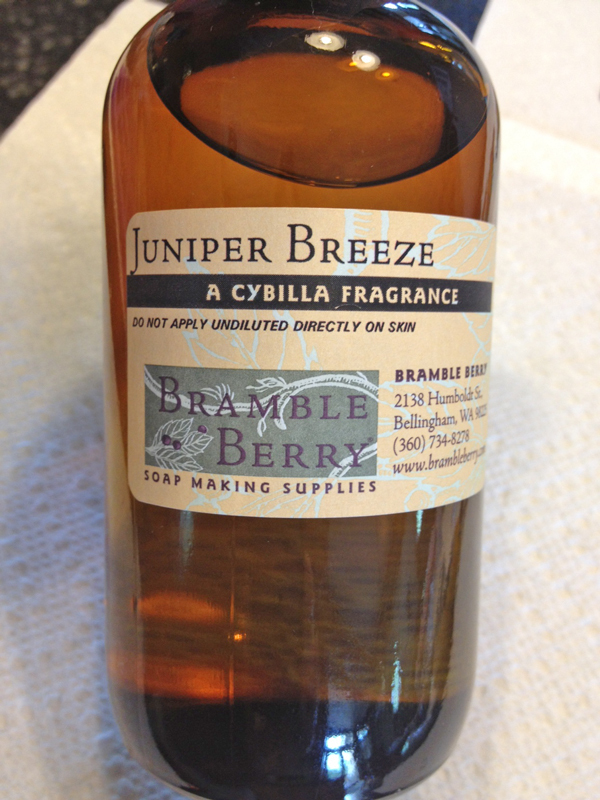 Bramble Berry's non-bleeding liquid colorants work great as they are easy to use and easy to mix to create new colors. 11. 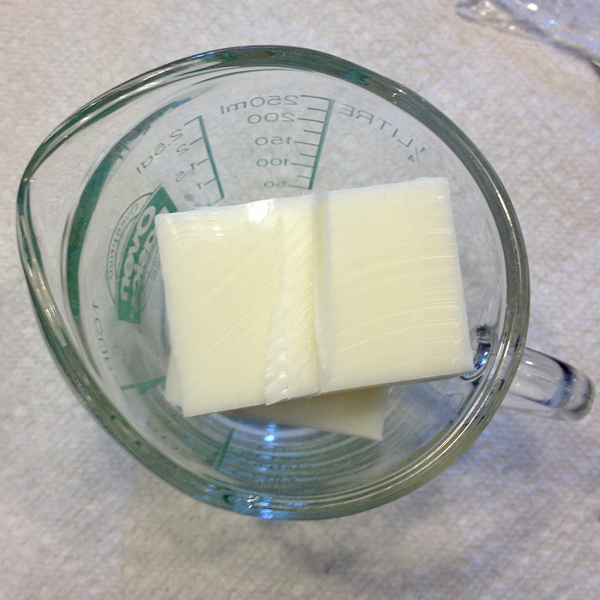 Once the white layer has set you are ready to pour the next layer. Again, when the melted base is 125 - 130 degrees F. Spritz the white layer well with alcohol and pour the melted soap to fill the cavity. Spritz again with the alcohol to remove any surface bubbles that have appeared. 12. Let set for at least 4 hours before unmolding. I love water soluble paper! This tutorial is wonderful, thanks for sharing. HP toners are not skin irritants or sensitizers in accordance with applicable regulations and standards set by the European Union and United States. Therefore, incidental skin contact with HP toners should not cause skin irritation or allergic response. For further information, please refer to the HP LaserJet toner Material Safety Data Sheets available at http://www.hp.com/go/msds . I am not familiar with rubber stamp ink. The ink needs to be safe for skin contact and it must dry so that it will not bleed into the soap. Some inks will bleed causing discoloration into your soap. Aloha...Beautiful soaps!!! Where did you find the fern picture? I love it!!! Where do you buy that paper?